Now on to my tale of woe. Last night, I decided to bake a treat for my office as a Christmas gift to all my coworkers. I found a delicious looking recipe for Honey Pistachio biscotti, bought the necessary ingredients and preheated the oven to 350. I was ready to work. I measured and poured, stirred and folded, mixed and kneaded. Everything was coming along perfectly until, lo, what is that burning scent accosting my nostrils?! 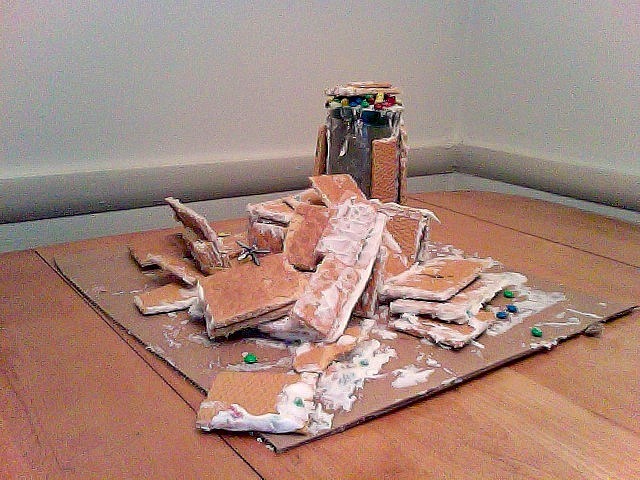 Suddenly, I remembered that Jordan and I had been using the oven to store one of the gingerbread houses from our party so the cat couldn’t get it while Jordan snacked on it. Like a champ, Jordan pulled the burning heap of cardboard/matchbox cars/stale graham crackers out of the oven and the smell began to dissipate. All’s well that ends well, right? Ha. The oven now empty and ready to go, I popped the two loaves of dough inside and shut the door. I was quite pleased with myself. I was going to have a great gift for my coworkers and could now relax until the biscotti needed to be sliced and re-baked. As I sat at the kitchen table, catching up on the news, Graycie began to mew in a very, very pitiful way. I was only slightly concerned. As you saw in the video, she’s quite vocal. Jordan and Rob continued playing video games, I continued reading intellectual things. Then the apartment began to get smoky and Graycie started freaking out. At this point, Jordan grew worried enough to suggest we check on the biscotti. He opened the oven door and, through the billowing smoke, saw two black logs of what had once been dough. It did not look like this. 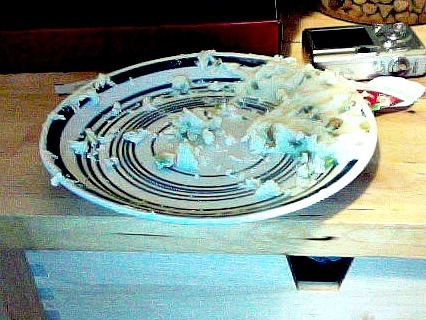 That’s right, it was so bad I couldn’t even bear to take pictures. “How did this happen? !” you ask. Somehow, in the midst of me baking and Jordan washing the dishes, it seems one of us bumped into the temperature dial on the oven. (We have a very small kitchen, it’s quite easy for that to happen.) 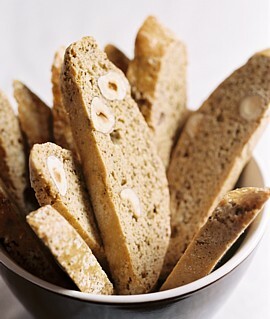 When we took the biscotti out, the dial was set somewhere between 550 and “broil.” In four minutes, the biscotti went from sticky dough to charred brick. After we opened the windows, turned on all the fans in the apartment and gave a very frazzled Graycie some cheese to soothe her (she loves cheddar), I cut the ruined loaves open to see what the centers looked like. Suprise: they were completely cooked and very bread-like! After all that, it was nine thirty and I still had no gift to bring to work. So what did we do? We jumped right back on the horse, that’s what. =P We decided to make something that didn’t require the oven and settled on White Chocolate Pistachio fudge. Jordan and I wish you all the very merriest of Christmases and hope your kitchens stay smoke-free! 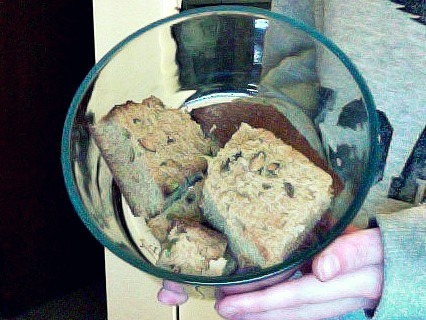 PS: Here’s the Honey Pistachio biscotti recipe if you’re interested! It sounds to me like Graycie saved your lives by alerting you to danger, ala Lassie. Good girl, Graycie!! This was the best blog yet–I laughed and laughed, plus got a great recipe! Thanks!